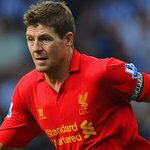 Steven Gerrard insists there is no panic at Liverpool. The Reds opened their campaign with a 3-0 loss at West Bromwich Albion, but picked themselves up the following week to secure a 2-2 home draw with champions Manchester City. However, any optimism that welcomed that point was crushed just six days later, when Arsenal left Anfield on the back of a comfortable 2-0 win. So Liverpool enter the international break with just one point from their opening three fixtures and, whilst it is still very early days, none of their fans will be happy to see them third-bottom of the Premier League table. Statistics show this is the worst start to a season they have made since 1962-63, but Gerrard is refusing to press the panic button. "When you're not winning football matches it's tough," he said. "But when you have my kind of experience, you don't panic after three games. We were fantastic against Manchester City and should have won. Against Arsenal it was the opposite. It's been a tough few weeks but it's not the time to panic. We can still take the club forward." It’s certainly been a difficult start to life on Merseyside for Brendan Rodgers, who replaced Kenny Dalglish as manager during the summer. The Northern Irishman could hardly hide his disappointment when, having seen the transfer window shut, his board had failed to deliver a replacement striker for Andy Carroll, who had been loaned to West Ham United. This leaves the Reds manager with just Luis Suarez and Fabio Borini as established strikers in his first team squad, and he has now revealed that this could lead to him giving a chance to teenage Spaniard Suso, who has been at the club since Rafael Benitez lured him from Cadiz in 2010.